One of the first best-selling self-help books ever published, How To Win Friends & Influence People is a result of Dale Carnegie's groundbreaking research into the art and science of being charismatic. 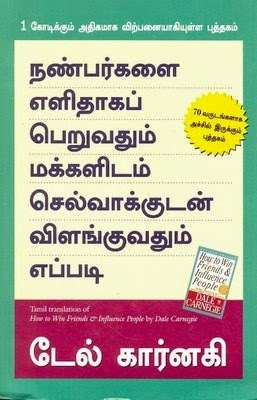 This edition contains the Tamil translation of the best-selling original. Divided into seven candid parts, this book explores the themes of becoming a charismatic individual. It teaches readers how to win people over through small improvements in the way they speak, act and behave. These little improvements will help readers build their natural magnetism and in turn helps others associate with them and open up to them better. Incorporating time tested and proven techniques, Dale Carnegie teaches readers how to be leaders and catapults them into a successful career as a people-centric individual. Dale Breckenridge Carnegie was an American writer, self-improvement course developer and lecturer, corporate trainer and public speaker. He is best remembered for his books: How to Stop Worrying and Start Living and Lincoln the Unknown.